_______________________ Thus, the Earth's two apsides are: the farthest point of its solar orbit, aphelion, and the nearest point, perihelion. And the Moon's apsides are its farthest point of Earth-orbit, apogee, and its nearest point, perigee. 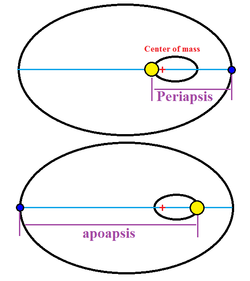 Periapsis and apoapsis as distances: the smaller, satellite body (blue) orbits the primary body (yellow); both are in elliptic orbits around their common center of mass (red +). The term apsis (Greek: ἁψίς; plural apsides /ˈæpsɪdiːz/, Greek: ἁψῖδες; "orbit") refers to an extreme point in the orbit of an object. It denotes either the points on the orbit, or the respective distance of the bodies. The word comes via Latin from Greek, there denoting a whole orbit, and is cognate with apse. Except for a theoretical possibility, there are two apsides in any elliptic orbit, (see discussion below, in article body); they are named with the prefixes peri- (from περί (peri), meaning 'near') and ap-, apo- (from ἀπ(ό) (ap(o)), meaning 'away from'), added in reference to the body being orbited. 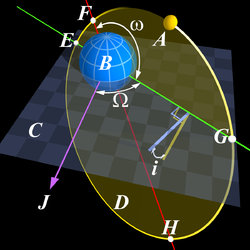 According to Newton's laws of motion all periodic orbits are ellipses: either the two individual ellipses of both bodies (see the two graphs in the second figure), with the center of mass (or barycenter) of this two-body system at the one common focus of the ellipses, or the orbital ellipses, with one body taken as fixed at one focus, and the other body orbiting this focus (see top figure). All these ellipses share a straight line, the line of apsides, that contains their major axes (the greatest diameter), the foci, and the vertices, and thus also the periapsis and the apoapsis (see both figures). The major axis of the orbital ellipse (top figure) is the distance of the apsides, when taken as points on the orbit, or their sum, when taken as distances.